"Here tulips bloom as they are told; Unkempt about those hedges blows An English unofficial rose..."
"This is every cook's opinion - no savory dish without an onion, but lest your kissing should be spoiled your onions must be fully boiled." "I will, from this day strive to forge togetherness out of our differences." "There is no love sincerer than the love of food. "I'm just like everyone. I like to feel togetherness with someone." 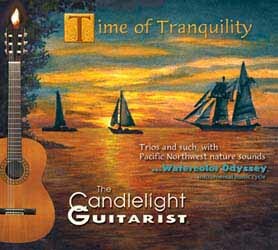 Time of Tranquility is the new CD from The Candlelight Guitarist. 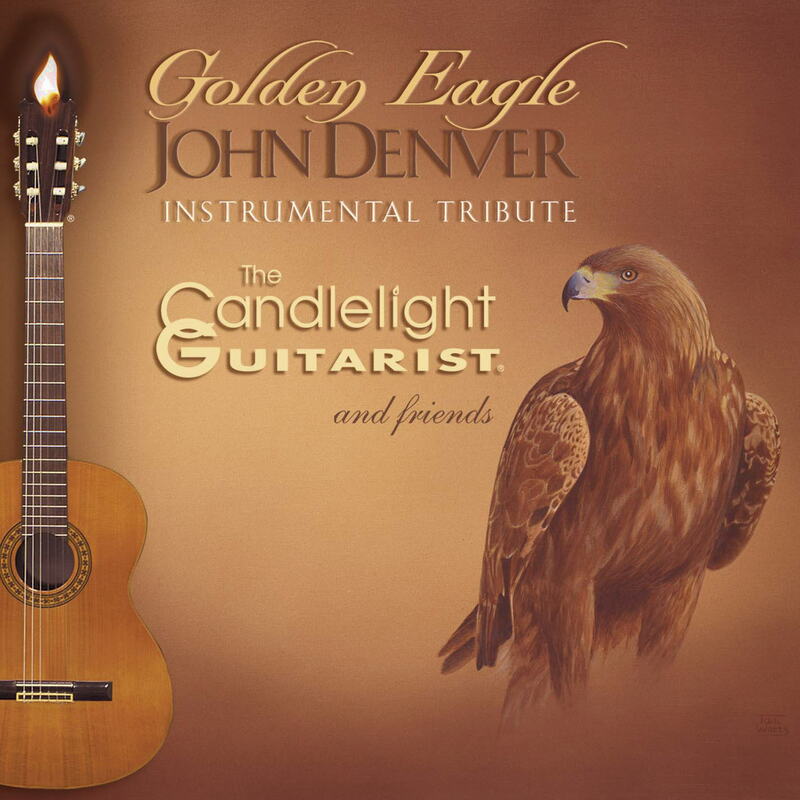 Centered on the theme of an evening gathering of friends & loved ones, it is instrumental music to warm heart 'n' soul. 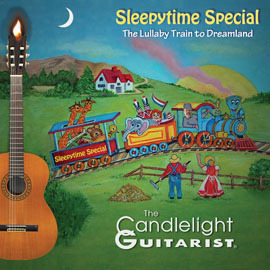 The CD offers over 58 minutes of relaxing, mood-enhancing evening music. 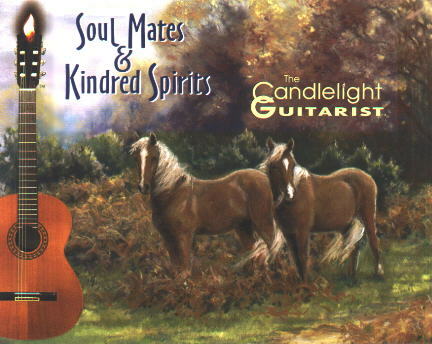 Intimate, yet varied, these "Trios and such" have the Candlelight Guitarist in various combinations, with cello, violin, alto flute, English horn, mandolin, flugelhorn, concertina, string bass and percussion. The Chef's Sonata, Brad's four-course musical tribute to the star of every great meal... the special person who turns a recipe into a savory experience. All the nature sounds were recorded in Washington and along the Oregon coast. The opening bells heard in Bells of Eventide were recorded at the historic Mission San Juan Capistrano. (See more details below). 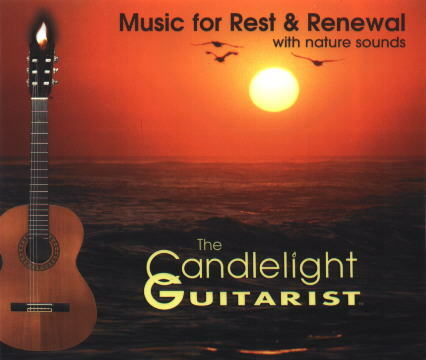 "Brad Powell, better known among music collectors as The Candlelight Guitarist', has produced yet another CD of music for guitar and for songs that are inspired by peace and tranquility. This album is particularly fine, released as it is in a time when tranquility seems almost completely out of reach with the world situation as chaotic as it is. But for those in sensory overload, buy this CD!" - Grady Harp, March 1, 2010 ~ Amazon.com TOP 10 Reviewer. "Eventide goes back to Old English aefen-tid and is found as early as the tenth century. It was common in literature through the nineteenth century. In Genesis 24:63 in the 1611 King James Bible, "Isaac went out to meditate in the field at the eventide." It was also used figuratively in a 1578 prayer: "This life hath not one hour certain, whensoever the eventide thereof cometh." The seven canonical hours of the church were called tides: "Nu wille ic thaet thu...singe thaer thine tida."  (Aelfric's Saints' Lives ca. 1000). Tide has also been used for over a thousand years in combination with other words to denote a definite time in the course of a day (noontide, eventide) or a season of the year (Apriltide, summertide) or a festival of the church (Eastertide, Whitsuntide)." The opening church bells in the track were recorded at the Basilica of the historic Mission San Juan Capistrano, California (above), with its 104-foot (32 m) bell tower. 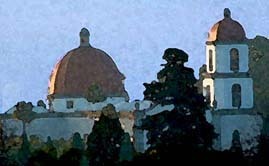 The Mission is also famous for the annual "Swallows return to Capistrano," traditionally observed every March 19 (Saint Joseph's Day). Brad asked his mom to paint the watercolor of the three tulips (on backcover), inspired by tulips in his yard (photo at right). He composed Tulip Festival as a celebration of the flower and the fun of Tulip Festivals. Here are some great tulip festivals in the United States and Canada. click on the links to learn more. Skagit Valley Tulip Festival, Washington State. Brad composed Mariner's Grace to fit the meter of the traditional mealtime grace of Mariners. Our praise to thee we sing. These "Trios and such" bring together longtime musical collaborators...it's a reunion of old musical friends. Ms. Bobbye Hall, percussion (congas, bongos, shaker, maracas, chimes and triangle). 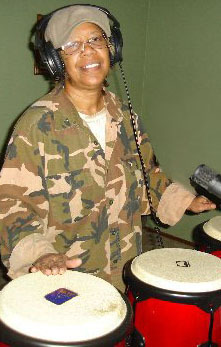 Bobbye has played percussion on countless hit songs and albums. She joined the famed Motown rhythm section at age fourteen, playing percussion on dozens of big Motown hits like I Heard It Through The Grapevine and For Once In My Life. Bobbye has played percussion on recordings by Joni Mitchell (For The Roses, Don Juan's Reckless Daughter, Hejira, Dreamland), James Taylor (Don't Let Me Be Lonely Tonight), Stevie Wonder (Songs In The Key Of Life, et.al. ), Bob Dylan (Street Legal, et.al. ), Bill Withers (Ain't No Sunshine, Lean On Me), Janis Joplin (Pearl), Carole King (Music, Fantasy, et.al.) --[it was Carole King who gave Bobbye the 'Ms.' nickname. ]...Stevie Nicks, U2, Seals & Crofts, Boz Scaggs, Bob Seger...the list goes on and on. Brad and Bobbye have performed together many times over the past fifteen years, but this is their first CD collaboration. On Time of Tranquility, Bobbye adds her percussion magic to the tracks Bells of Eventide, Tulip Festival, Coloratura, Breaking Bread, and Light In The Night (Luz En La Noche). Melissa "Missy" Hasin, cello. Missy was born in Hollywood and raised in Newport Beach, California. Her parents wanted her to focus on classical music, but her experience playing electric bass in blues and rock bands as a teenager, coupled with influences like Jaco Pastorius and John Patitucci, led her to become a leading jazz cellist in the country. As a session musician, Missy has worked with a wide range of artists from Barbra Streisand and Natalie Cole, to No Doubt (which used Missy on its 1996 hit "Don't Speak") and gangsta rapper Snoop Dogg. Others she has recorded with include David Benoit, Teddy Edwards, Tori Amos, John Tesh, and Melissa Manchester. On stage she has backed Sammy Davis, Jr., Smokey Robinson, Frank Sinatra in 1996, and Led Zeppelin alumni Robert Plant & Jimmy Page in 1997. On Time of Tranquility, Missy plays on The Chef's Sonata, Adagio, Twilight Tango, A Playful Appassionata, and Celestial Concertina. 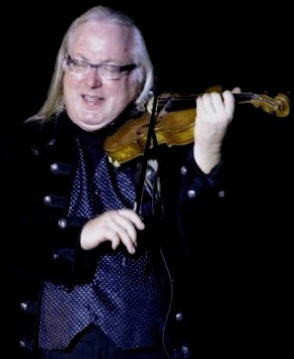 Jim Sitterly is featured here on violin, mandolin and concertina. 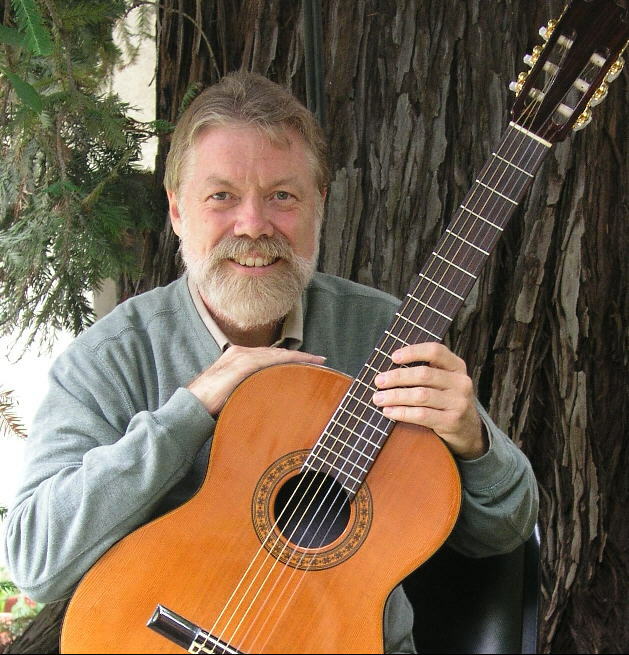 Jim Sitterly holds a Doctor of Musical Arts from USC, and has studied violin under Henri Temianka and other great teachers. Dr. Sitterly is the concertmaster of the South Central Chamber Orchestra--a multi-ethnic organization which records for such luminaries as Luther Vandross, Lionel Richie, Macy Grey, Stevie Wonder, Lucy Pearl, Tribe Called Quest, Qtip, Raphael Shadiq, and other artists. He is concertmaster of the television show orchestras for LOST and ALIAS, and has been featured violinist on commerical jingles for Albertson’s, Intel, Adidas, Taco Bell, Visa, Washington Mutual and Sizzler. He is concertmaster/solo violinist for John Tesh, and has played on 10 of his CDs, 4 DVDs, and over 500 concerts in this capacity. On Time of Tranquility, Jim plays violin on The Chef's Sonata, Adagio, Twilight Tango, and A Playful Appassionata, the concertina on Celestial Concertina, and mandolin on Tulip Festival and Mariner's Grace. Gilberto Hildavio - alto flute, English horn and recorder. 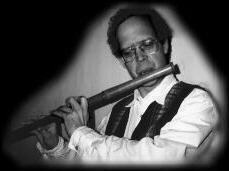 A multi-woodwind artist, Hildavio plays all flutes (piccolo to bass flute, Native American wood flute, Irish flute, et.al. ), oboe and English horn, clarinets, saxes, penny whistle, and more. Hildavio has performed with a wide-array of artists, including Sergio Mendez, Diana Krall, Kenny Rodgers, Barry Manilow, The Manhattan Transfer, Melissa Manchester, The Four Tops, Percy Faith, Glenn Close (Sunset Blvd. ), and the Los Angeles Philharmonic Orchestra. He has performed throughout much of the world, including Asia and Europe, with several music tours of Brazil and Japan. In his spare time, Hildavio teaches Yoga. On Time of Tranquility, Hildavio plays alto flute on Togetherness, Coloratura, Centerpiece, Light In The Night (Luz En La Noche), and recorder on Mariner's Grace. On Lady of The Sea, he represents 2/3 of the trio, playing both alto flute and English horn. Paul Seaforth is featured playing flugelhorn on the track Breaking Bread. 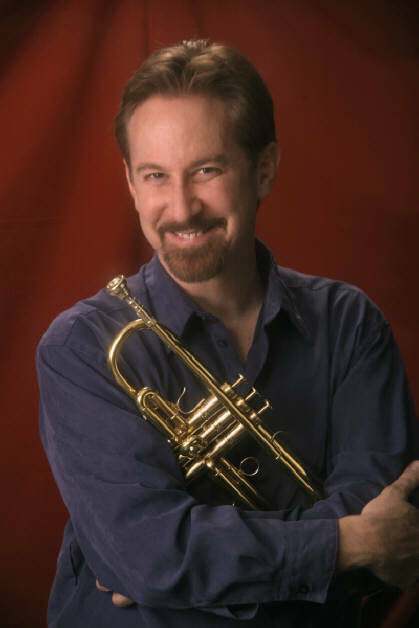 Paul has a Masters degree in Classical Trumpet Performance from the University of California, Irvine, and has performed around the world, from Carnegie Hall to Tchaikovsky Hall in Russia. He has performed with Dizzy Gillespie, Eric Marienthal, Brandon Fields, Russell Garcia, George Graham, Dash Crofts, Vic Damone, Louie Shelton, Lincoln Mayorga, Pat Boone, Dan Seals, Tierney Sutton, Buddy Childers, Bill Watrous and others. Paul even performed on an episode of The Gilmore Girls, along with The Swing Dolls--introduced by Rory Gilmore. Paul is a "triple-threat" musician: besides being a great trumpet and flugelhorn player, he is a soulful saxophonist, and sings like a blend of Chet Baker--Kenny Rankin--Michael Bublé. Catch Paul's latest CD release "Something Real"---it's wonderful! Ernie Nunez, string bass. Ernie has recorded and toured with The Brian Setzer Orchestra and Les Brown's Band of Renown, Charles Rutherford's Pacific Jazz Orchestra, Shades of Jade, Peggy Duquesnel Trio, Paul Seaforth, Tracy Wells, Scott Martin Latin Soul Band, and many other artists. Ernie is equally at home in jazz and latin sessions, classical ensembles and symphony orchestras, as well as the popular and eclectic genres. In fact, if you've got VW bus and wear a Jerry Garcia tie, you've likely heard his bass playing on the eclectic tribute CD: Swingin' to the Grateful Dead. 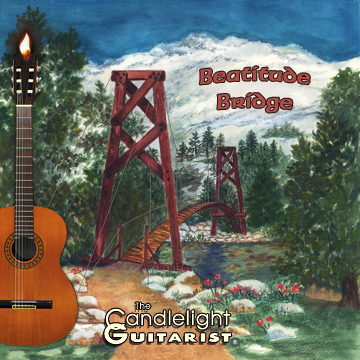 In this, Ernie's third Candlelight Guitarist CD, Ernie is featured on Bells of Eventide and Tulip Festival as well as laying down the bass lines on Togetherness, Coloratura, Centerpiece, and Light In The Night (Luz En La Noche). 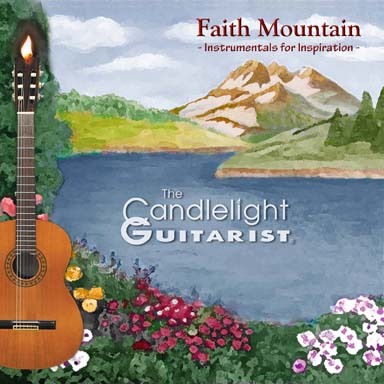 And, of course, The Candlelight Guitarist, Brad Powell, plays the guitar and composed the music...with love, to all who give a listen and "light a candle!" "Name for series of items written to be perf. as...linked thematically either musically or by subject, esp. song-cycle (Ger. Liedercyclus ). In opera the greatest cycle (4 operas) is Wagner's Der Ring des Nibelungen"
Time of Tranquility is the second CD in this instrumental music cycle. 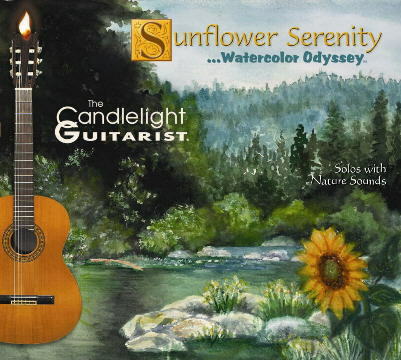 Sunflower Serenity (solos) was the first, and more will follow. May they bring you enjoyment! Time of Tranquility and other CDs in the Watercolor Odyssey series feature watercolor cover art by Brad's mother, Dorothy Powell, who at 93 years young, is an active painter in her community of Anacortes, Washington. 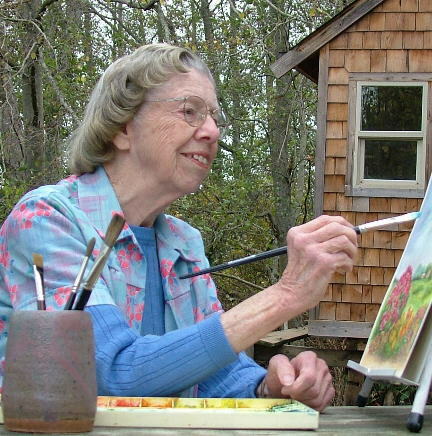 Dorothy began painting at the age of 57, after her husband, Hayward (Brad's dad), passed away. She has won "Best of Show" and many other honors in county fair and local art shows, and sold many paintings and notecards featuring her artwork. She's an active member and past-president of Artists Northwest -an association of artists in Northwest Washington.